After 1947, post-colonial and independent India witnessed the emergence of a reorganisation of higher education in the country, radically different from the colonial perspective and perception, our national leaders adopted a wider perspective on the character of higher education in free India : "to provide a coherent picture of Universe and integrated way of life". The Radhakrishnan commission (1948) laid down aims and objectives of.Higher Education : i) transmission of intellectual and ethical knowledge of humanity to the young: ii) enrichment of this heritage, iii) extension of the boundaries of knowledge; and iv) promotion of social values and virtues. If we situate the foundation of our college within this perspective and attainment of such a dream, we can only then understand the driving force, zeal endeavour of our founder, Prof, Bijoy Krishna Bhattacharya. A well known freedom fighter, Satyagrahi, Prof. Bhattacharya's dream became a reality when on August 16, 1948, the college with the help of Late Kiran Chandra Sinha, Late Bholanath Mukherjee, Late Krishnadhan.Chatterjee, Late Dr. Beni Charan Dutta and Late Gangesh Chandra Mukherjee was named after the late Dinobundhoo Mukherjee, a renowned physician and an educationist of Howrah district. On the 1st of December 1947, Prof. Bijoy Krishna Bhattacharya, President of the Managing Committee of Shibpur Dinobundhoo Institution, proposed in a Managing Committee meeting that Intermediate Classes may be started in the school building. 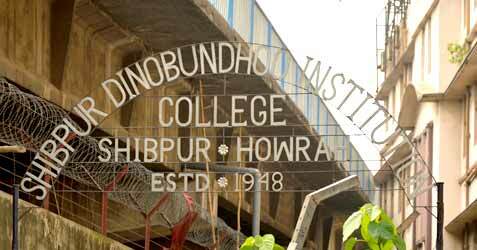 The Secretary of the school applied to the University on 23rd of December 1947 seeking affiliation of Shibpur Dinobundhoo Institution up to the Intermidiate standard in Arts and Science streams. A Governing body was constituted consisting of Shri Poolin Behari Haldar, as secretary. Three representatives of the School Managing Committee viz, its ex-officio President, Secretary and Headmaster were appointed as members of the Governing Body in recognition of the initiative taken by the Managing Committee to establish the college and the financial help granted by the school to the committee.